As Rhett Wiseman launched the Vicente Campos offering towards the Skyliner roller coaster on Monday night, it gave the Senators a 4-2 advantage and him the outright lead in all of minor league baseball with eight home runs on the young season. To say the 24-year-old outfielder has been hot is an understatement. Earlier in the day, the Eastern League announced that he was named the Player of the Week after hitting .424 (14-for-33) while driving in 13 runs and compiling a 1.061 slugging percentage through the season’s first ten games. It would have been tough two years ago to picture this kind of performance from Wiseman when he struggled in his first taste of High-A ball. He matched his home run total of 13 from the previous season and still eclipsed 20 doubles, but the outfielder scuffled to a .229/.283/.391 slash line in 123 games with the Potomac Nationals. The next spring the Nationals minor league hitting coordinator Troy Gingrich began working with Wiseman on changing his swing. The Massachusetts native came to the Nationals with a strength-based swing that relied on his upper body to generate his swing and the power behind it. 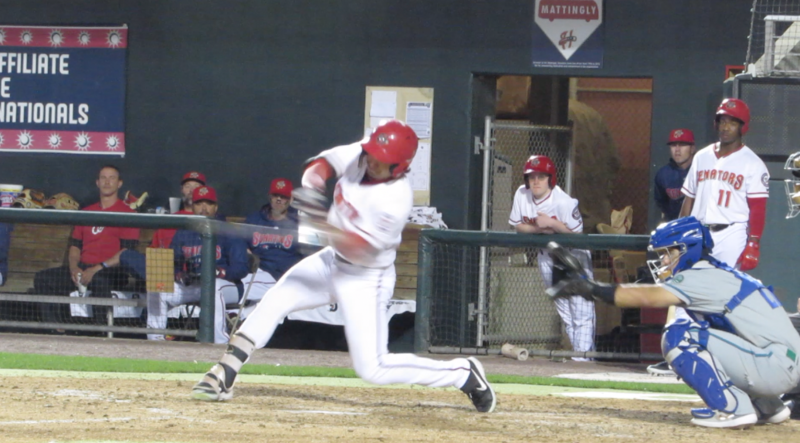 Wiseman took to the change and slugged 21 homers during his second go-round at Potomac in 2018. But there was still a lot of work to be done on the consistency of his at-bats and covering the entire strike zone. “It took him a decent amount of time for him to feel it,” Gingrich said. “Last year he was able to get where he could pull a lot of balls but still be in his legs. But pitches on the outer half he would come out of it. The physical adjustment has initiated a series of positive developments down the line. Wiseman is now able to trust his hands and use his legs to generate power. That, in turn, allows him to wait longer which helps him with pitch recognition. And all of that adds up to a better approach and mindset on each pitch of an at-bat. “When you’ve done something your whole life, it takes time,” Gingrich said. “It just took him a little longer to figure out how to stay connected using his legs and still feel like he’s behind it to generate the same amount of power with an easier swing. A prime example is this at-bat against Hartford reliever Jordan Foley where Wiseman was able to sit and wait on the outside pitch instead of jumping out on his front foot and rolling over it. Before this season, Harrisburg hitting coach Brian Rupp had only seen Wiseman in spring trainings but knew the left-handed power hitter was searching for answers. For illustration, here’s Wiseman at contact on that above double off the center field wall. There is still a lot of baseball left this season. Wiseman is going to have the usual ups and downs. Opposing pitchers are going to change the way they pitch to him, and he’s going to have to make adjustments to that. But so far, the changes he’s made at the plate have paid huge dividends with early results. “He’s much shorter and much quicker to the ball now than he was,” Nationals’ assistant general manager Doug Harris said. “His balance is better. He’s using his legs better. But I think the biggest change for me is his ability to use his hands. This entry was posted in Uncategorized and tagged Harrisburg Senators, Rhett Wiseman, Troy Gingrich, Washington Nationals. Bookmark the permalink.